4-disk series that outlines some of the challenges and possibilities of leadership and influence geared to wisdom. Dr Mark Strom became CEO of Laidlaw College (formerly BCNZ) in 2005 and led Laidlaw through a period of unprecedented change until 2010. Prior to coming to Laidlaw College, Mark served as an advisor on leadership and strategy to heads of commercial, government, educational and non-profit organisations. Many leaders in Australia, New Zealand, Canada, USA and Singapore have heard Mark speak or participated in seminars and workshops based on his material, the Arts of the Wise Leader. In this one day Wineskins Seminar, Mark outlined some of the challenges and possibilities of leadership and influence geared to wisdom. 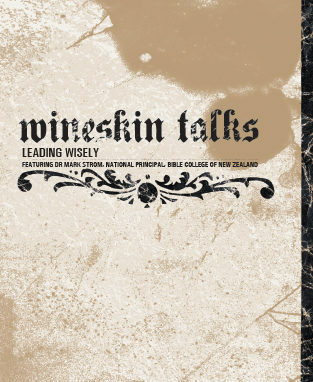 Unlike Mark’s regular presentations in the wider market, this Wineskins series opens with a discussion of a few of the theological perspectives that inform Mark’s work.